Now that we have gotten started with our winter workout, I thought it might be helpful to address some common hitting flaws and myths or misconceptions about swing mechanics I have noticed over the years and have tried to address in my own coaching. These are not my ideas, but the teachings of pros I have learned from online and in books. So this is a common refrain we all remember our coaches telling us growing up. But when you slow down the best swings in baseball, we see this simply is not what happens with the back foot. Plus, the teaching is far enough removed from what actually happens on a good swing, it may hamper the swing more than improve it in the long run. When we say “squish the bug” players take this literally and tend to believe they have to keep that foot on the ground throughout the entire swing. This may restrict their power and reign them in from fully releasing their hips and allowing the hips to explode or shift into the ball. Watch Joe Mauer and Mike Trout. Their back foot rotates and ends up on its toe during weight shift, to allow the hips to function properly in the swing. But it doesn’t “squish the bug”. Their back foot may come off the ground when the weight shifts forward, only to come back down to maintain balance throughout the swing. The back foot may even gain some ground and move forward. Here is another video of what the back foot actually does in an MLB player’s swing. That said, I agree with those coaches who say trying to teach our youth players the advanced power swing of a Mike Trout or Bryce Harper may over complicate things, and we should really focus on keeping things simple for our younger players. Tony Gwynn said being balanced and swinging the knob not the barrel are the two things you have to do to be a good hitter. This became condensed in Tony Gwynn’s footsteps to take the “knob to the ball”. Most instructors today believe that taking the knob directly to the ball fails to get your swing properly on plane and can lead to a chopping down type swing plane. So while the thought of taking the “knob of the bat” to the ball might work for elite level hitters who already have a good spine angle and tilt to end up in the proper swing plane, this teach may have some adverse consequences for our young kids. “Swinging the knob” and “not the barrel” is perhaps the most short hand way to teach a hitter how to stay inside the ball, in 6 words or less. Taken literally, however, it can lead to problems like a lagging barrel at contact which simply filet’s balls into right field with no pop. So there is no simple refrain that will solve the riddle for everybody. According to Justin Stone, and other great hitting instructors, we should try and emphasize the entire kinetic chain, and complete hitting sequence leading up to contact. Rather than telling kids to take the “knob to the ball” when casting the barrel, or focussing on “extension” or what the hands are doing, when trying to correct swing flaws. Instead, we should focus on the process of the hitting sequence that is causing that outcome. I am so impressed with Justin Stone’s ability to articulate swing mechanics, while at the same time keeping hitting mechanics in perspective, by realizing how important other aspects of hitting, mental approach, pitch recognition, and timing are paramount. We often hear youth coaches today telling their players to swing down on the ball. This is perhaps the most difficult one for me to swallow, because when you swing down on a ball, you can only accomplish 2 things. You either hit a ground ball, or miss hit the bottom of the ball which results in a pop-up; both of which, more often than not, end up as outs. Because we want line drives, which more often than not result in base hits, we should not teach our kids to “swing down on the ball”. Obviously, there are exceptions to any rule, and if a kid has a drastic uppercut, this might work as a strategy for that kid, out of everyone else’s ear shot. But generally the proper swing plane requires us to swing in an arc that is trending slight upward at contact. Ted Williams’s The Science of Hitting at page 47, has a great diagram and explanation of this. That said, some great MLB hitters told themselves to “swing down” on the ball, and that helped them hit line drives. So the distinction between what subjective cues might work for a given hitter, and what objective cues work often times might be very different things. Everybody will respond to different subjective cues; but generally, if we want our kids to hit line drives, we need to be getting our bats in the proper swing plane not by “swinging down on the ball”. Whatever accomplishes that objective result is spot on! How do we get to the proper swing plane? This brings the barrel level with the ground, with the knob pointing toward the pitcher and the back elbow slots against the ribs. Our lower half, at this point, should have the back leg in a power “L” position with the front leg stiff and pretty straight with a slightly open front foot. This is the power position we need to get into to get the bat properly on plane so we can teach our kids how to “attack the inside of the ball”. Notice the back shoulder is slightly lower than the front shoulder in this power position. The back shoulder turns around the tilted axis we created in our stance. In order to swing properly, your back shoulder has to be lower than the front shoulder at contact. And the swing plane is not “level”. We certainly don’t want to be dipping the back shoulder and hands like Domingo Ayala, in this video. This is the bad form of “dipping the shoulder”. But if you tilt your body forward at the waste, with your chest leaning over the plate a bit, your shoulder will naturally swing around your tilted spine angle, and will dip in a good way. Check out Manny Ramirez in this video addressing the issue. The swing plane should be in an arc that is slightly trending up and through the ball at contact. If you stand straight up in your stance you may end up dipping the shoulders in a bad way or leaving your shoulders entirely level throughout the swing. That will result in a completely rotational swing that takes your barrel in and out of the zone too quickly. It can cause a lot of other problems too: roll overs, ground balls, casting the barrel, and swinging around the ball, making it very difficult to hit the outside pitch well. John Madden, of youGoPro.com, explains the issue well here. According to Josh Donaldson and his former teammate at Auburn, John Madden, a good swing plane results from starting with the back shoulder up and finishing with the back shoulder down. Josh Donaldson doesn’t like to think about what his hands are doing, and prefers to think of his back shoulder as delivering the swing. The swing plane actually levels out on pitches higher in the zone, but should be in an arc moving slightly uphill at contact on pitches lower in the zone. Here is a video of arguably the best swing in Baseball: Joe Mauer. 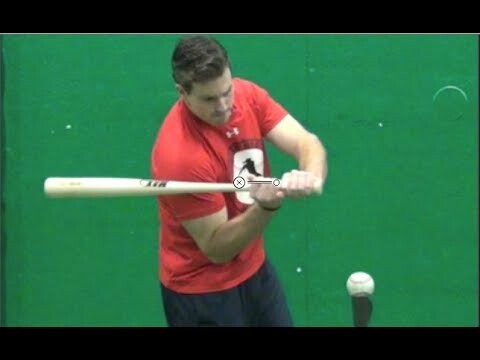 Drill of the Week Video: Justin Stone of Elite Baseball demonstrates the step and hit tee drill that we have been using with the boys in our cage sessions.